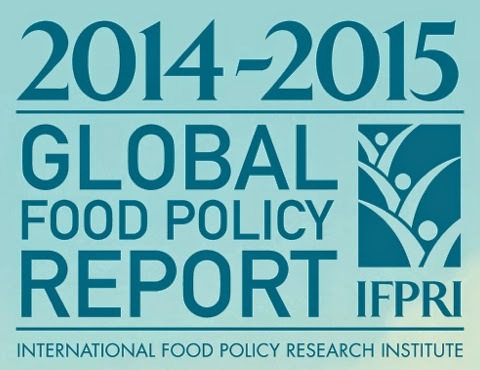 Today sees the launch of IFPRI's 2014 Global Food Policy Report. Dean Spears and I have a chapter in it on sanitation and nutrition (actually, Dean did most of the work). The paper looks at the links between WASH (mostly sanitation) and nutrition through different types of evidence, research implications and implications for policy. * observational evidence: noting (among other things) that kids in West Bengal, just across the border from Bangladesh, come from higher income households than their Bangladeshi counterparts but have lower height for age scores. We cite evidence that suggests (it is observational after all) the rapid decline in open defecation in Bangladesh (from 34% in 1990 to 2.5% in 2012) has something to do with the fairly rapid decline in stunting in Bangladesh. * impact evaluations: here we note, with the exception of a study in Mali, that sanitation interventions have not shown much impact on child stunting (or other nutrition status outcomes). The main reason is that the interventions were not effective in changing behaviour around open defecation. No change in behaviour, no change in nutrition status. So we need to design better interventions. This is the challenging first stage of WASH interventions (see below). * research priorities: these include, obviously, research that will help construct interventions that will change WASH behaviours. Simply providing household toilets is not sufficient and in some case may not even be necessary (communal might be OK). Behaviour change in this domain (pretty much like in most domains) is complex and varied partly because it is so wrapped up in diverse cultural norms. * policy implications: First, invest in (and evaluate) pilots that attempt to change behaviours around open defecation and other practices that we think negatively affects nutrition status. Second, be careful in wanting to make WASH nutrition sensitive. It may help WASH become more effective at reducing nutrition by emphasising the consequences of current WASH behaviours, but it might also overload frontline workers and the bureaucracies behind (or on top of) them. 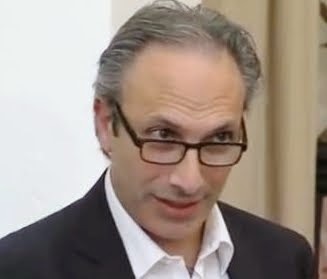 It is not every day that a study based on a 30 year prospective cohort is published, and when it is led by Cesar Victora, in Lancet Global Health, we had better pay attention. The study was trying to become the first to directly explore the association between duration of breast-feeding and earnings. There had been much suggestive work showing indirect links between earnings and breastfeeding (via things like child IQ and school enrolment), but nothing directly linking breastfeeding to adult earnings. The study tracked 5914 newborns from 1982, born in 5 maternity hospitals in Pelotas, Brazil. In 2012-13 the authors were able to do follow up analyses on 3493 members (some could not be traced, some had died, some had incomplete information on IQ and breastfeeding). The study measured the duration of breastfeeding (21% of sample less than 1 month; up to 17% of sample greater than or equal to 12 months) and the duration of predominant breastfeeding (26% of sample less than 1 month; up to 12% of the sample greater than or equal to 4 months; defined as "the age when foods other than breast milk, teas or water were introduced". The authors say that exclusive breastfeeding was "seldom practised at the time", hence they did not analyse it). The study controlled for potential confounders such as monthly family income, household assets, maternal education, maternal age, pre-pregnancy body mass index of mother, type of birth delivery, gestational age, birthweight and, interestingly, genomic ancestry (based on DNA samples). The study found that adult IQ was significantly increased by duration of breastfeeding and by duration of predominant breastfeeding, as were educational attainment and adult income. The results are even more striking, I think, for predominant breastfeeding. Predominant breastfeeding covers a shorter period and is associated with a monthly increase in income that is over 80% of the income increase associated with longer durations of (not necessarily predominant) breastfeeding. It is too bad the exclusive breast-feeding data were not suitable for analysis. 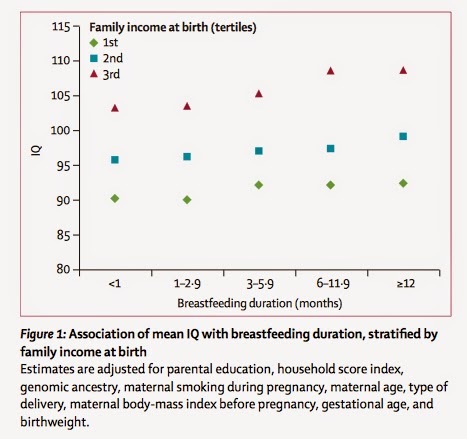 The increases in IQ and educational attainment are associated with increases in monthly income (IQ is responsible for 72% of the "effect" of breastfeeding on income). How big are the income changes? For the difference between lowest and highest duration of breastfeeding the effects are big: nearly one year of additional education, 4 points in IQ and about an additional one third of the average income. How many education and income generation programmes would like to show that size of effect? A lot. Is the methodology good enough? The authors are careful to emphasise this is an associational study--for causation you would have to randomly assign babies to breastfeeding and non breast-feeding groups and of course that is not ethical. The authors check on attrition (are the people they found in 2012-13 sufficiently representative of the original set of newborns?) Yes. They control for confounding variables using regression analysis (although unlike economic journals, medical journals never seem to give much detail on the regression methods used--hey at least they still publish these kinds of associational studies, but that is another point). There is some recall data on duration of breastfeeding for 4% of the sample, and this is found to be of reasonable accuracy. Seasonality of monthly income is not a major issue in this urban population. IQ tests were not done for parents, but educational attainment was included as a proxy. The study also notes that the breast-feeding mechanism (is it the content of the breast milk or is it the bonding) cannot be determined, and admits the possibility of influence of unmeasured confounders such as intellectual stimulation or simply the woman's motivation to be a good mother. In all cases the authors do more than enough to assure me (if I had been a reviewer) that they are cognizant of the study limitations, have done all they can to address them, and that they do not undermine the fundamental finding of the paper. This is a carefully done study that finds large and significant associations between breastfeeding, IQ, education and income. Can we be definitive that the findings are causal? No. Can we be confident that they are? Yes. Economic policymakers, I hope you are listening. The Dutch Global Nutrition Report roundtable on March 10 was a blast. Over 100 people, were convened by the Netherlands Working Group on Food and Nutrition (a multistakeholder group), the Ministry of Foreign Affairs, the Food and Business Knowledge Platform and Unilever (the event was hosted at the home of its R and D centre, where I learned they have 300 scientists!). I also learned that the Dutch are the tallest people in the world (not verified by the GNR!). I gave a presentation of the GNR with some added slides for the Netherlands (see here). 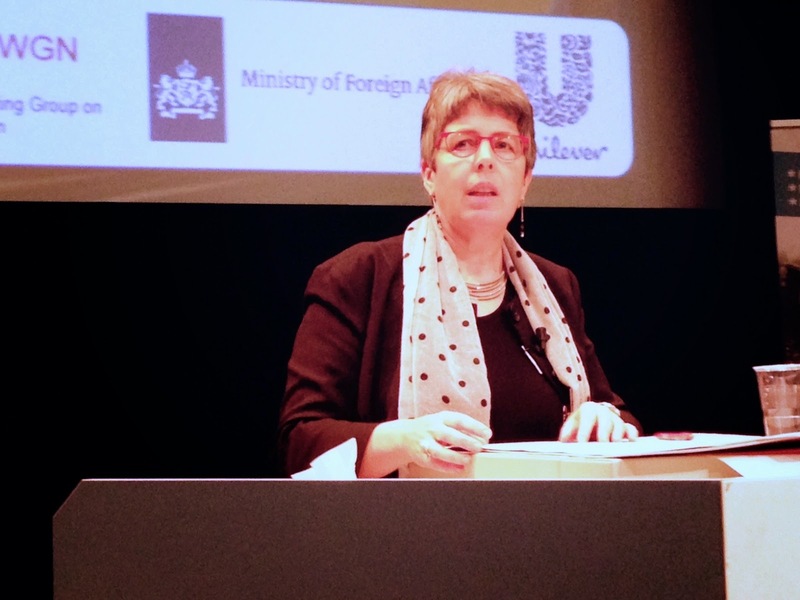 Then Reina Buijs, the Deputy DDG of the Ministry of Foreign Affairs (in picture) presented the outlines of the new Dutch vision for Food and Nutrition policy. We were chaired well by Paulus Verschuren as the Master of Ceremonies. 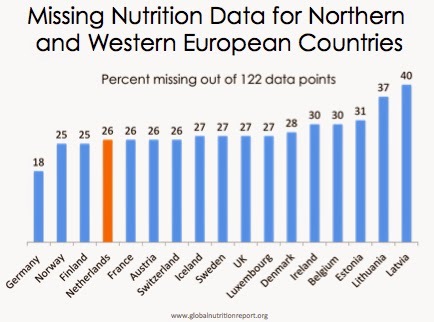 My Dutch slides were on their financial performance (large increases between 2010-12 on commitments, less so on disbursements), N4G commitments (none on policy) and data gaps (the Netherlands is missing about 25% of the data we could expect high income countries to have on nutrition). I also made a quick excursion to the English language version of the Ministry of Foreign Affairs website (only 27 mentions of nutrition and on closer inspection only 2 of these strictly relating to nutrition—SUN and ICN2). And I noted that while the Dutch were one of few donor countries to make statements at ICN2, the statement contained no SMART (specific, measurable, assignable, realistic and timebound) commitments. I urged the Dutch to lobby harder on getting nutrition into the SDGs. I think the Deputy DG (a respected nutrition professional herself) took the messages on board. I highlighted the need for food systems to be central to the 21st century’s “triple threat” of hunger and undernutrition, obesity and NCDs, and sustainable resource use and climate change. The outlines of the emerging Dutch food and nutrition policy reflects the first and last of these threats, but, somewhat uncomfortably is silent on obesity and NCDs. Because these issues affect domestic as well as international citizens, the question of institutional lead will be contested—here and in all high income countries. The real star of the roundtable, however, was the “House of Commons Debate”. All of us moved to a narrow area where two long rows of chairs were placed facing each other, with a narrow aisle in between. We were shown a series of propositions (e.g. “the first 1000 Days is the only priority for nutrition intervention”, “the Dutch government should prioritise food fortification”, ATNI should be used for naming and shaming companies that do poorly" and “the Dutch government should triple its nutrition spending”) and we had to sit on one side (agree) or the other (disagree). People were encouraged to stand up and explain their positions and, if so moved by the arguments they heard, to move across the aisle. It was facilitated very skillfully by the chair of the Dutch Debating Association (who did a great job of not letting any of us steal his microphone) and it was great fun. The questions were well framed, forcing us to choose, even though we wanted to hedge our bets (at least I did) and the format really forced people to speak, listen, and not take entrenched positions. Wise people are known to change their minds based on solid evidence and logic, we were told by the facilitator. Come to think of it, this was much better than the real House of Commons! Even though the questions were deliberately divisive, the atmosphere was not. At the end I reflected that if this debate had taken 10 years ago, it would have been less civil, with less aisle crossing and some people may not have been talking to each other the next day. I was really impressed by the passion, knowledge and sophistication of the Dutch nutrition community and I learned quite a few things from the evening’s discussions. We have come a long way in the nutrition community in the past decade—there is much more that unites us than divides us. Now we have to engage with influential decision makers who do not think much about nutrition. That is the biggest behavior change communication challenge of all. We look to the Dutch to stand tall for nutrition. Does the World Bank care enough about malnutrition? The title of this blog may seem strange to some. The World Bank has made some very important intellectual and policy contributions to nutrition over the years, from Alan Berg to Judy McGuire, Harold Alderman, Meera Shekar and Leslie Elder. But it feels, to me at least, as if nutrition is not quite the priority it should be at present within the Bank. If true, this lack of focus comes at a bad time. The SDGs are being set in quick drying concrete and there is only a month or so to affect the contours. 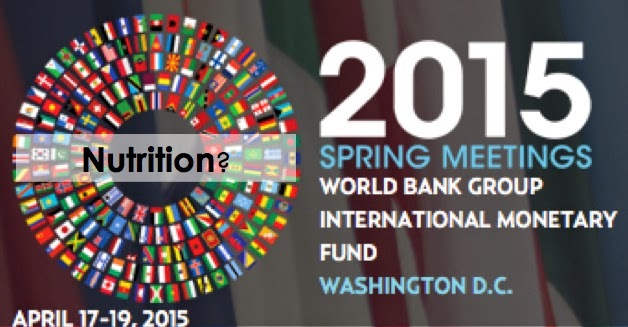 The Spring meetings of the Bank/IMF might be the last throw of the dice to embed nutrition more firmly within the post 2015 framework. So what am I basing this concern on? Admittedly as an outsider my evidence base is thin. I have to rely on the following pieces of “evidence”: (1) of 71 World Bank Press Releases in February 2015, only one was on nutrition, (2) out of 925 Topics in the Open Knowledge Repository of publications only 1 Topic heading is on nutrition (“Nutrition and Population”). Within the 232 publications in that Topic heading I could only find 23 that were actually on nutrition (under and overnutrition), and (3) the crudest of all measures, a Google search on “Jim Kim nutrition”, does not exactly turn up a treasure trove of statements (try it). Words and publications are nice but surely, you say, money talks. Well, data provided by the Bank to the Global Nutrition Report shows that its commitments to direct nutrition programmes (“nutrition specific” interventions in the jargon) have increased dramatically between 2010 and 2012, from $55 million to $248 million. Commitments to indirect programmes (known as “nutrition sensitive” interventions, such as certain types of agriculture, cash transfer programmes and water and sanitation programmes) were estimated to be about $2 billion in 2010 and $1 billion in 2012 (the commitments are lumpy by nature, being large and multiyear). Nevertheless, in 2012 the World Bank was the second largest provider of ODA to nutrition, after the US Government. So what am I complaining about? Well, the financial picture is far from clear—disbursement figures are lower than commitment figures and hard to interpret, for example. But my main plea is not about money, it is about ideas. I want the Bank to become an intellectual leader in nutrition once again. This is important because the Bank is the leading shaper of development thinking and nutrition is the quintessential post 2015 sustainable development issue. Consider the following 3 features of a post 2015 development issue: (a) it affects nearly all countries, (b) it affects intergenerational equity and (c) it is best addressed through collective action. Nutrition has all three features. On the first, the Global Nutrition Report finds that nearly every country has a serious public health problem with nutrition. On the second, we know that malnourished mothers are more likely to give birth to malnourished babies, and that they are more at risk of growing up to be malnourished adults and, if women, the cycle continues. Finally, because there are so many sectors involved in the production of good nutrition, all stakeholders have to work in harmony and sometimes collectively (as in the Scaling Up Nutrition movement). Even at the level of nations, international standards on healthy diets will do more to drive the food system towards good health for people (and for the planet) than national standards alone. To this the Bank might say, hey, all we really care about is eliminating extreme poverty. Now extreme poverty is pretty sensitive to increases in GDP per capita. But stunting, the preferred measure of chronic malnutrition, is much less so. And yet it is hard to think of a more complete, if grisly, composite indicator of deprivation than the height of a child for its age. Every insult in the area of food, care, infection and neglect is captured and accumulated in a kind of negative rate of return, observed as height, which is a mere marker for the things we really care about: mortality and neurological and cognitive development. Society needs to make it easier for parents to make the right choices for their babies and infants. Stunting should be the indispensable complement to money metric poverty. If both of these can be eliminated we have conquered poverty today and tomorrow. So nutrition needs the Bank to re-energise its interest in nutrition. The Bank is the premier development institution and nutrition is a key development issue. The Bank can help to make development decision-makers recognize that. But perhaps equally importantly, the Bank needs nutrition: to ensure that when poverty rates decline, they do so for this and for the next generation. To mark International Women's Day I wanted to write about something that has been niggling me. While the Global Nutrition Report has been well received, one of the things people said we could have done better was to draw out messages about women and gender. I agree, hence this blog. What are the links between nutrition and women’s empowerment? 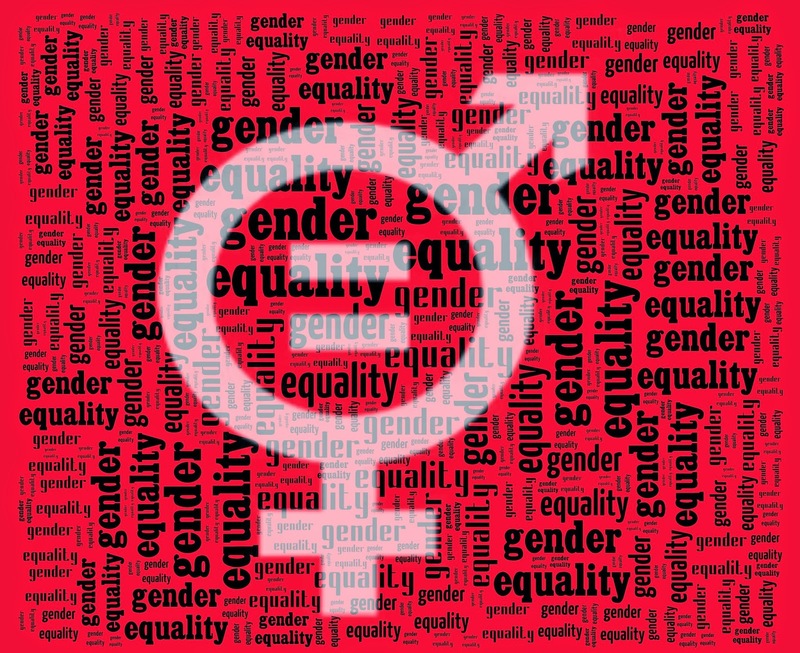 What are the links between nutrition, women’s empowerment and gender equality? First of all, the Report makes it clear that improvements in nutrition are important to achieve gender equality and to empower all women and girls (Sustainable Development Goal 5, Table 2.2). While globally there are no large differences between male and female stunting or wasting rates at the under 5 level (see the UNICEF 2013 Report), the difference in power between males and females really becomes visible as girls reach adolescence. Very young age at marriage is a sign of gender asymmetries in power and young age at marriage is followed by young age at first birth which tends to be bad for the health of baby and mother as the mother is still a child herself. In addition married girls are more likely will be taken out of school if they are enrolled or be discouraged from entering in the first place (Africa’s female secondary school enrollment rate is still low at 53%, Figure 6.3). Wherever there are gender differences in stunting rates (and it would be good to find a global analysis of this-we couldn’t) addressing them will help minimize schooling attainment gaps and wage rate gaps later on in life. What impact would a reduction in gender asymmetries have on under 5 stunting rates? Second, the report uses a model published here to understand how underlying determinants of nutrition status would have to change to get stunting rates below 15% (equivalent to the WHA 2025 target, see Panel 2.4). The required increases in all underlying determinants (food security, water and sanitation coverage and secondary enrollment rates for females) are close to past performance, with one exception: the ratio female to male life expectancy at birth. This ratio is about 1.07 for countries where, relatively, there is less discrimination against women. For countries with well documented and strong discrimination against women, this ratio is closer to one and in some cases below one. This ratio would have to increase substantially faster than historical rates of improvement to reach the WHA target. So gender asymmetries are very likely to be the main constraint to reaching the WHA targets, at least at the global level and certainly for regions like South Asia where gender asymmetries are largest. What is the state of women’s nutrition status? Third, we focus on key indicators of women’s nutrition status. For example, anemia rates in women of reproductive age are shockingly high and going down very slowly. They were 32% in 2000 and 29% in 2011 (Table 3.1). In fact only 5 countries out of 185 are on track to meet the World Health Assembly targets for anemia in women of reproductive age (Figure 3.7). Some attribute the slow decline of anemia rates to the low political power of women in society. Women’s anthropometric indicators, such as stature and body mass index, show many missing data gaps. In fact only 67 out of 193 countries have indicators on women’s short stature, thinness and overweight (Table 4.2). Only one third of these 67 countries have women with good nutrition--that is they have rates for these three indicators that are all below public health cutoffs. That means two thirds of all countries have a serious problem with one or more of these conditions (Table 4.2). How well are we doing in scaling up nutrition interventions that address women’s nutrition status? Fourth, on the coverage rates of direct nutrition interventions (nutrition specific) the report demonstrates the absence of national programmes that focus on the pregnant mother. There are no national programmes for the 3 proven interventions during pregnancy: balanced energy-protein supplementation, calcium supplementation and multiple micronutrient supplementation (Table 5.1). Moreover there are no national programmes on folic acid supplementation pre-pregnancy (and although there are national programmes during pregnancy, median coverage rates are well below 33%, Table 5.2). Fifth, the report brings together evidence on how to make interventions in nutrition relevant sectors (e.g. agriculture, social protection, education and WASH) even more nutrition sensitive. All of the different recommendations agree on one thing—involve women in a decision making way on the prioritization, design, implementation and evaluation of more nutrition sensitive versions (Table 6.3). This is because much empirical research has shown that when women exert more control over household resource allocation, the nutrition status of the children in the household—and everyone else—improves, even at a given income level. Finally, the report discusses the two laws that are vital to maternal and child well-being. Only 54% of 164 countries for which we have data have enacted laws encompassing many provisions of the code of marketing of breastmilk substitutes. In addition only 51% of 169 countries with data have ratified the ILO’s Convention 183 on maternity leave protection (Figure 7.3). Given the vital importance of the first 1000 days post conception to a child’s start in life, and the fact that passage of laws does not equal implementation and enforcement, these rates are definitely a case of cup half empty. Does the report have much to say on women’s nutrition, gender asymmetries and women’s empowerment? Most definitely. The links between nutrition and women’s empowerment –in both directions—are clear. Reductions in gender asymmetries in longevity outcomes seems to be the critical constraint to accelerating reductions in stunting. Fully two-thirds of countries with data show women having serious public health nutrition issues in one or more of three nutrition dimensions: short stature, thinness or overweight. Improvements in women’s nutrition status indicators, especially anemia, seem slow. Coverage rates of programmes targeting the preconception and pregnancy periods are particularly weak. Half of all countries do not have laws and conventions in the area of maternity leave and the marketing of breastmilk subsitutes, both of which would better protect women and infants in the first 1000 days after conception. The nutrition status of women is vital in its own right and is of course closely linked to the nutrition status of their children, but it is also connected to the nutrition status of their household, community and nation. The empowerment of women makes policy interventions in a large number of sectors more nutrition sensitive. The process of women’s empowerment must be supported more vigorously. Gender equality is fundamental to justice, and it is fundamental to nutrition.